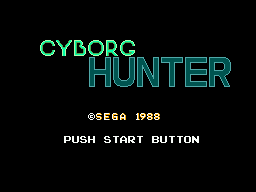 Cyborg Hunter, known in Japan as Chouon Senshi Borgman (超音戦士ボーグマン), is an action game developed and published by Sega in Europe and Japan for the Sega Master System, and published by Activision in the US. It is based upon the Sonic Soldier Borgman anime series. However, the branding was removed when the game was released outside Japan. Two other Borgman, Anice Farm and Chuck Sweagar also appear in the ending as "Catherine" and "Trevor" respectably even though they do not appear in the game. Year is 2242. Monstrous Cyborgs,("Youma" which translates to "Devil" or "Demon" in Japanese version) under control of their violent leader, Vipron want to take over the universe. Players will assume control of "Paladin" (Ryo Hibiki) a bounty hunter who managed to infiltrate the headquarters and preparing for the final showdown with Vipron. He is assisted by Adina (Memory Gene) who will provide support during the operation. Paladin must attack different locations within the Cyborg Fortress and acquire weapons and equipment that will help him survive this tough mission. Cyborg Hunter is side scrolling action game. Button one attacks with selected weapon while button two jumps. Players can access inventory screen by pressing any button on the second controller. Similar to Cyber Shinobi, a large status screen covers the upper part of the gameplays screen. A pseudo-3D screen on the left part allows players to detect enemies from afar. Status screen also gives a rough map of the area. In each area, players must defeat a number of "Chief Cyborgs" in order to proceed. Chief Cyborgs are depicted in white while regular cyborgs are red. In addition to the new weapons and equipment, players can collect power ups to recover life or psycho power meters. Cyborg Fortress is divided into four sections and each of these has one or more areas needed to be completed. Getting necessary Key Card from the boss of the section will allow characters to get to the next block. Vipron is located in Area G of Section 4. Some bosses can only be defeated with a certain weapon. Similar to Metroid series, players can revisit each location but once the necessary items is obtained, there is little reason to do so as the game is quite linear and playing the areas in order is the only way to proceed. Normal Punch Your standard method of attack. Avaiable from start. Psycho Punch Ranged and powerful projectile attack. Each shot reduces the P.P. gauge. Avaiable from start. Ray Gun Causes same damage as normal punch but ranged. Does not use P.P. gauge. Light Gun Same as Ray Gun but each shot will pierce the darkness momentarily. Does not use P.P. gauge. Psycho Gun Most powerful ranged weapon but will drain P.P. gauge quickly. Bomb Set with pressing Up. Damages all enemies in the screen. Not too powerful. Shield Allows players to pass through the force field in Area B.
ID Cards Acquired from bosses, these cards will allow you to pass the next section of the Cyborg Fortress. Jet Engine Allows player to fly. Prevents going through doors while active. Main article: Cyborg Hunter/Magazine articles.